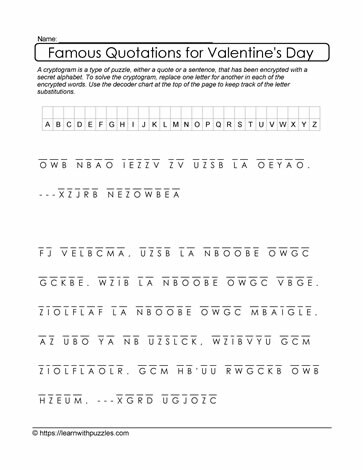 2 Valentine's Day cryptogram puzzles. Here are 2 Valentine's Day quotations cryptograms to challenge the brain and activate problem solving strategies. Suitable for high-school students in 9-12 grades classrooms. Augment curricula in regular, digital, Google and homeschooling classrooms using downloadable, printable puzzles. Use differentiated instruction to facilitate student access in earlier grades. To solve, decrypt the encoded alphabet in each quotation. Record unique letter substitutions in the table provided. Authors' names appear after ellipses.